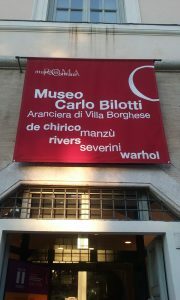 The Museum Carlo Bilotti is located in the elegant edifice of the Orangery in the park of Villa Borghese. It is one of the many and interesting museums of the Municipality of Rome scattered around the capital, and is free of charge. It is hosting an engrossing exhibition of the first period of Giacomo Balla, a painter and sculptor whose works developed in the first half of 20th century going from realism to abstract art; he was also a major representative of Futurism, an avant-garde movement. Balla lived near the park in 1904 in a large apartment in via Paisiello in the chic district of Parioli. He depicted the trees and landscapes of Villa Borghese from the balcony of his study or immersed in the green just outside his house. Villa Borghese is in the heart of the city stretching from Pincian Hill facing piazza del Popolo to Parioli for eighty hectares. Besides strolling in the beautiful park, visitors can admire the Lake Garden, various temples and fountains, piazza di Siena, venue of the renowned international horse show, look at the Water Clock and at a reconstruction of the Globe Theatre, as well as visiting the Borghese Museum and Gallery and the Rome zoo (Bioparco). The Orangery is another interesting place to see. The edifice was deeply altered throughout the centuries. Its original structure dates back to the 16th century but was completely refurbished in the late 18th century by Marcantonio IV Borghese in a new project that involved the area of the Lake Garden where the Orangery was a place of leisure. The building was severely damaged during the battles of 1849, when the Roman Republic fell under the pressure of the French army. It was acquired by the Municipality of Rome in 1903 together with the rest of the park. Museum Carlo Bilotti is an important example of collaboration between public and private enterprises. It is a meeting place of art and culture situated in the centre of Villa Borghese thanks to the donations of Carlo Bilotti, an Italian-American entrepreneur who worked in the field of cosmetics. He was a collector who opened his collection of renowned art works to the public both in Rome and in Cosenza (his home town), donating twenty-two works to the museum. They are paintings, sculptures and drawings mainly by Giorgio de Chirico, but there are also works by Larry Rivers, Andy Warhol, Gino Severini and Giacomo Manzú. Unfortunately, the room dedicated to de Chirico is temporarily closed due to repairing works. The areas dedicated to temporary exhibitions are a large part of the museum both at the ground floor and at the first floor. In a room by the entrance, a video clip introduces Balla’s art and career from his beginnings as a student at the Royal Albertine Academy in Turin to the time he spent in Paris and his arrival in Rome where his fame soared. At first he became famous for his portraits, where he applied the techniques of light and shadow from photography. Among his students there were Umberto Boccioni and Gino Severini who introduced Balla to Futurism. He signed the Manifesto of Futurism in 1910 moving to an abstract pictorial style that conveyed sensations through colours and geometrical shapes. The study of movement and speed was paramount in this period. Even his daughters’ names, Luce (light), and Elica (propeller), were inspired by this avant-garde movement. Futurism meant to destroy the past and rebuild a new future in a constant change and regeneration. It relied in slogans such as ‘we will free Italy from her innumerable museums which cover her like countless cemeteries’, or ‘a racing motor car is more beautiful than the Victory of Samothrace’. In politics Balla was a socialist, opposed the establishment and was involved in the literacy campaign together with Duilio Cambellotti. They meant to improve literacy in the countryside around Rome, the Agro Pontino, where there was a high percentage of illiterate peasants and very poor conditions due to the Pontine marshes and the spreading of malaria. At the end of his career, Balla embraced a more realist, figurative style again. The exhibition displays enthralling pictures, mainly pastels, of views, trees, fountains, alleys and sculptures of Villa Borghese. The artist explored the park over and over again, simplifying the forms and modifying the colours. For Balla, Villa Borghese was like the mount of Sainte-Victoire for Cézanne, a great source of inspiration, that allowed him to investigate reality to the point of an abstract research of purity. The core of his art remained the study of light and movement throughout his career. A few portraits on display testify his skilful use of chiaroscuro merging the lesson of the masters, such as Caravaggio, and the new techniques of photography he learned in Paris. The influence of Impressionism and Divisionism, characterized by the separation of colours in spots, are also present in some of the works, such as ‘Germogli Primaverili’ (spring buds), ‘Villa Borghese dal Balcone’ (Villa Borghese from the balcony) or the pictures of trees. They emphasise the attentive study of shades that create dynamism and movement. A nocturnal study of ‘Le Torri del Museo Borghese’ (the towers of Borghese museum) reveals a modern interpretation of light and shadow reminiscent of van Gogh’s lesson. A research of simplified forms almost to the abstraction is in ‘Fontana’ (fountain) and ‘Cantano i Tronchi’ (the trunks sing), where the lines evoke the shapes in deep contrasts with the background. Some landscapes depicting the suburbs of Rome are also on display showing how Balla was a complete artist, mastering portraits, landscapes, close up details as well as sculptures. ‘Linea di velocità + forma rumore’ (1913-1914, 1933) is the only futuristic work of the exhibition. It is an installation in chromed brass showing in its sharp angles and convoluted curves the vibrant quality he attained in his investigation of movement and speed. This is a compelling exhibition that successfully presents some of Balla’s less known yet fascinating pieces centred on the theme of Villa Borghese in the enchanting atmosphere of the Orangery, immersed in one of the most beautiful parks of Rome.